We need your help during National Farmworker Awareness Week! There are currently about two million farmworkers in America. And for far too long, they have been among the most abused, overlooked, and poorest paid workers in this country. 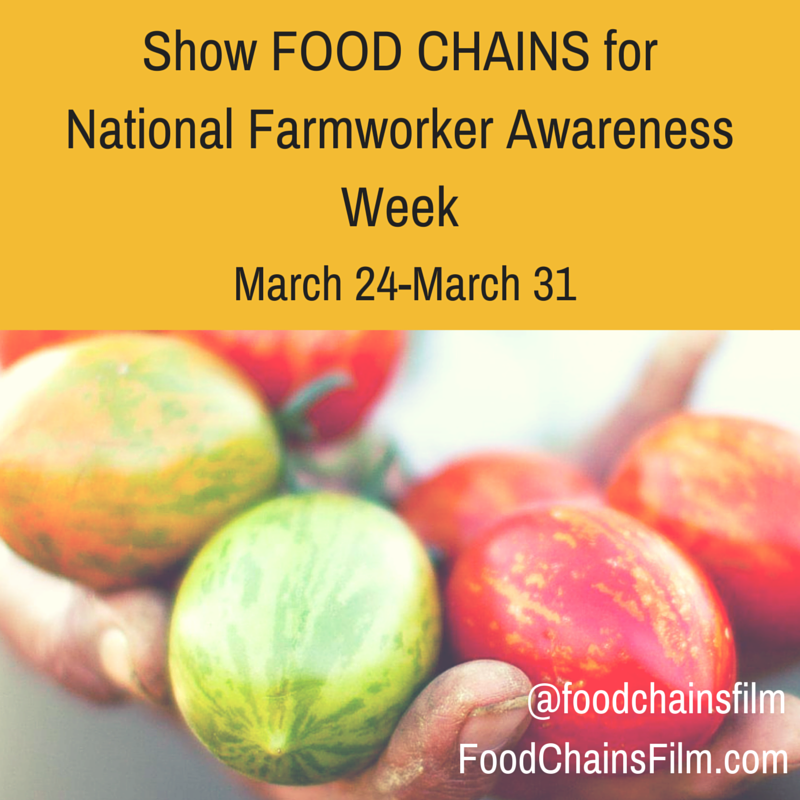 During National Farmworker Awareness Week, take the first step towards creating change by collecting your community and hosting a screening of FOOD CHAINS or watching FOOD CHAINS online. WHAT CAN YOU DO DURING NATIONAL FARMWORKER AWARENESS WEEK? Join the movement to make a difference in how the American food system treats the hands that pick our food. For this week only, Food Chains screenings will cost only $99 for the public performance rights, promotional material, and extensive discussion guide. This cost is reduced from the usual $295. By coming together to discuss justice for farmworkers, you will help galvanize your community around the need to change how farmworkers are treated in America today. Watch the film for only 99cents between March 24th and March 31st through the film’s website​and see for yourself what is happening daily in American fields. Then, go to the FOOD CHAINS a​ction page​or F​acebook​page to join the conversation! Get your organization involved in this vital conversation. Add the note below to encourage your members, readers, or listeners to host a screening in their area! Bring @FoodChainsFilm to your community! Host a screening of the film and help strengthen the conversation around justice in the fields during National Farmworker Awareness Week, March 24th through 31st. Email r​ebecca@picturemotion.com​to find out more. Is your food fair? Join the conversation & screen @foodchainsfilm this March. Email rebecca@picturemotion.com​today! Farmworkers feed us all! Join National Farmworker Awareness Week & screen @f​oodchainsfilm.​Email rebecca@picturemotion.com to find out how. Help bring justice to the fields. Screen ​@f​oodchainsfilm​during National Farmworker Awareness Week. Email rebecca@picturemotion.com today.